The good ... the bad ... the Twitchy. The sequel finds our heroine, Red (Hayden Panettiere), training with a mysterious covert group called the Sisters of the Hood. But Red is forced to cut her training short when she gets an urgent call from Nicky Flippers (David Ogden Stiers), the head of the super secret Happily Ever After Agency, aka the HEA. A wicked witch (Joan Cusack) has abducted two innocent children, Hansel (Bill Hader) and Gretel (Amy Poehler), and Nicky needs the whole Hoodwinked gang -- Red, Granny (Glenn Close), the ever-clueless Wolf (Patrick Warburton) and his over-caffeinated little partner, Twitchy (Cory Edwards) -- for the search and rescue mission. $4.108 million on 2505 screens. With a gross of only $51 million, 2006’s Hoodwinked didn’t seem like the best candidate for a sequel. However, the computer-animated comedy/adventure cost a mere $15 million, so it turned a profit and probably did fine on video as well. So five years later, we got the follow-up: 2011’s Hoodwinked Too! Hood Vs. Evil. In this one, we learn more about the Happily Ever After Agency (HEA). Led by amphibian Nicky Flippers (voiced by David Ogden Stiers), Red Riding Hood (Hayden Panattiere) is its star agent, but she’s off at a retreat to study with the mysterious Sisters of the Hood. In the meantime, evil Witch Verushka (Joan Cusack) kidnaps and plans to eat Hansel (Bill Hader) and Gretel (Amy Poehler). Sick of being in Red’s shadow, the Big Bad Wolf (Patrick Warburton) leads an impetuous campaign to rescue the kids. This goes awry, however, and fellow agent Granny (Glenn Close) ends up the prisoner of the witch. While at her training, Red learns of her Granny’s abduction – as well as the secret of a magical chocolate truffle that confers super powers on its possessor. Verushka steals the recipe but lacks the secret, unwritten ingredient. Granny knows the missing link and may be forced to divulge it if Red and her cohorts can’t rescue her in time. 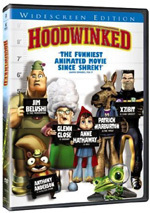 Despite some pretty terrible animation, I liked the original Hoodwinked. It took the Shrek approach to skewed fairy tales but worked better than the ogle flicks, in my opinion. I liked the way it integrated pop culture into its story and thought it amused and entertained. Alas, the sequel can’t live up to its predecessor, though I do regard it as a relative disappointment. Hood got terrible reviews and a pathetic 11 percent on Rotten Tomatoes! Though it definitely didn’t work as well as the original, it wasn’t that bad. Geez – an atrocity like the third Transformers movie got a 36 percent but Hood ends up with 11 percent? That just doesn’t make much sense. 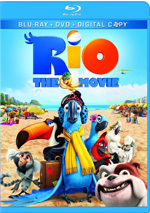 Though since the original received only 47 percent – way below much less interesting movies like this year’s banal, forgettable Rio, which earned a perplexing 72 percent – I guess it’s not surprising that a clearly inferior sequel would score much lower. Would it have done better without the existence of the original movie? Probably, but even if Hood didn’t come as a sequel, it still would’ve suffered from two flaws. For one, it’s awfully busy. It clearly subscribes to the “more is better” philosophy, as it throws as much attempted humor as it as it can conjure. The film favors quantity over quality; it just delivers any minor joke it can invent and hopes some will work. And some of them do, but the hit:miss ratio is pretty low. That leads to the movie’s other problem: it seems rather stale. Like most modern animated flicks of this sort, it invests heavily in pop culture references, many – most? – of which we’ve heard elsewhere and heard often. You can almost predict the jokes before they occur; it occasionally feels like a computer surveyed common references and shoved as many of those into the film as it could. This doesn’t cripple the movie, as it still manages an occasional funny bit, but those don’t appear with the desired frequency. The original film featured some of the stiffest animation seen in a 21st century feature. Though Hood shows the benefits of six years of technological advancements, don’t expect big leaps in quality. While Hoodwinked’s characters looked like they were made of ceramics, here they boast a more rubbery feel. It’s still not especially good, but at least the movie doesn’t look like it was shot was little porcelain dolls. Hood does benefit from a good cast. On the negative side, it loses Anne Hathaway as Red, and Panattiere isn’t a great substitute; she’s acceptable in the part but not memorable. However, it replaces Jim Belushi with Martin Short as Kirk the Woodsman, so that’s a step up, and it adds fine talents such as Cusack, Poehler, Hader and others. The actors can’t work wonders with the weak material, but they do their best and add some life to the flick. Is that spark enough to make me recommend Hood? No – not unless you really loved the original and want to see more from the characters. Of course, if that’s the case, you’re probably not waiting for my recommendation. If you’re on the fence, I think you can do worse than Hood, but you can find many superior animated efforts as well; this one’s mediocre at best. Hoodwinked Too! Hood Vs. Evil appears in an aspect ratio of approximately 1.78:1 on this Blu-ray Disc. Though not one of the best animated transfers I’ve seen, the image usually looked solid. Sharpness was the only minor weak link. While the majority of the picture seemed concise and accurate, some wife shots displayed a smidgen of softness; the picture never became especially ill-defined, but it just looked vaguely off on occasion. Still, those instances were modest. I noticed no issues with jagged edges or moiré effects, and the movie didn’t demonstrate any edge haloes. Print flaws remained absent. This was the kind of fresh, clean image one would expect from a modern animated flick. With its fairytale setting, the flick boasted a broad palette. The colors always appeared vivid and lively, so they gave us satisfying tones. Blacks were deep and dense, and shadows looked clear and well-displayed. Only the slight softness kept this one from “A”-level consideration. For the most part, the film’s DTS-HD MA 5.1 audio was good, though one concern popped up: volume. The movie came mastered at a rather low level, so even when I cranked the volume higher than usual, it often seemed a bit feeble. The flick still boasted some good punch at times, but it lacked the power I’d expect. Otherwise, this was a satisfying mix. The soundfield delivered the action environment one would expect from a wild movie like this. All five channels boasted good activity and movement, as the various elements zipped and zoomed around the room. The soundscape opened up the environment and delivered a nice sense of life. Ignoring the volume, audio quality was positive. Speech remained concise and clear, without edginess or other issues. Music seemed bright and peppy, while effects were clean and accurate. They didn’t deliver the zip I expected, but they were still more than adequate. With more punch, this would’ve been at least a “B+”, but as it stood, I thought this was a “B” track. Only a handful of extras come along with the movie. A collection of featurettes called The Voices runs a total of 19 minutes, 13-seconds. We hear from director Mike Disa and actors Hayden Panattiere, Patrick Warburton, Heidi Klum, Wayne Newton and David Ogden Stiers. We get some notes about cast, characters and performances. Most of the comments seem pretty forgettable – they tend toward ordinary descriptions and praise – but we find a lot of good footage from the recording studio. I always like shots of voice actors at work, so those moments make the featurettes worthwhile. Three music videos appear. We find Hayden Panattiere’s “I Can Do It Alone” (3:34), Lavay Cole’s “You Know It” (3:03) and CeeJ’s “Perfect Two” (3:13). I don’t think much of any of the songs, and the videos are decidedly dull. All use variations on the standard combo of lip-synch performance footage and movie clips. The Panattiere video is especially lazy and looks like it cost about 28 cents to make. Two segments show up under Storyboard Sequences. We get “Bridge” (3:45) and “HEA Invasion” (0:44). Both show story reels that let us watch the boards accompanied by audio. They work well and give us a nice look at the original planning art. Under Production Artwork, we find a still gallery. 38 images appear, as we see characters and sets. It’s not a great collection but we do locate some decent material. The disc opens with ads for Spy Kids: All the Time in the World and Rio. Though we get two teasers for the Hoodwinked Too! video game, we find no trailer for the film itself. A second disc provides a DVD Copy of the film. This is a full retail version, so it comes with all the standard bells and whistles. Because I regarded its predecessor as a pleasant surprise, I felt disappointed with the lackluster Hoodwinked Too! Hood Vs. Evil. While not the disaster reviews make it seem to be, the movie suffers from a pointlessly frenetic pace and too many recycled jokes. The Blu-ray offers nearly great picture and mostly satisfying audio but lacks substantial supplements. This is passable family entertainment but not something I can really recommend.